Product prices and availability are accurate as of 2019-04-16 22:20:31 EDT and are subject to change. Any price and availability information displayed on http://www.amazon.com/ at the time of purchase will apply to the purchase of this product. 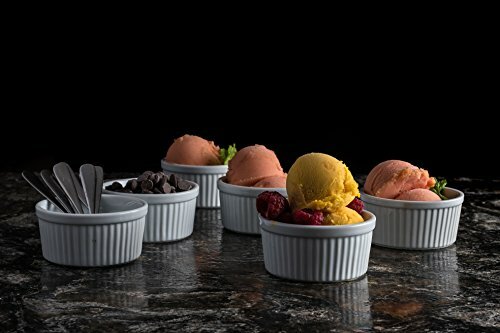 From making individual desserts and baked eggs to holding prepped cooking ingredients and party dips, ramekins can be real workhorses in your kitchen and on your table. 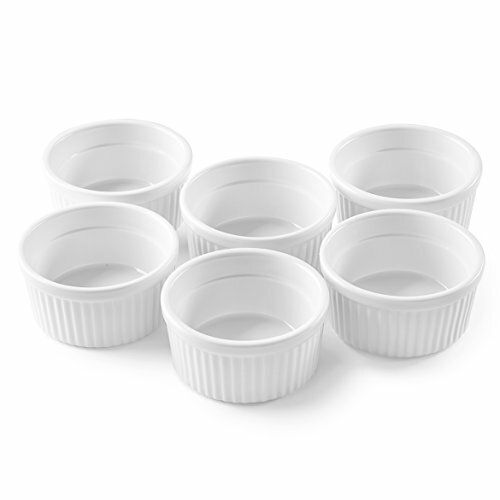 So you need ones that are durable, versatile and attractive ... like the Bellemain Porcelain Ramekins. Thanks to their substantial thickness, you don't have to handle Bellemain Porcelain Ramekins with kid gloves. They're glazed inside and out so they won't absorb food odors, flavors or colors, and will be easy to clean. This also means that they won't leach any potentially harmful elements into your food as some plastics and metals do. These ramekins can do just about anything that requires a container. Bake lava cakes in the oven (up to 400°F); organize your "mise en place" (chopped and measured ingredients) ; serve salsa and shredded cheese at your taco buffet; store leftovers in the fridge and reheat them in the microwave. This convenient size measures 3.75" diameter x 1.5" high -perfect for individual servings of pudding, fruit cobbler, baked egg breakfast, etc. They make portion control while dieting easy. You can even use them to keep small sewing, craft and desk supplies conveniently at hand. PERFECTLY SIZED FOR SINGLE SERVE DESSERTS AND SOUFFLES: The 4 ounce ( cup) ramekins Measure 3.75 in diameter and are 1.5 high. They are ideal for serving dips, salsas, dressings, sauces, appetizers, and side dishes like olives and bruschetta. 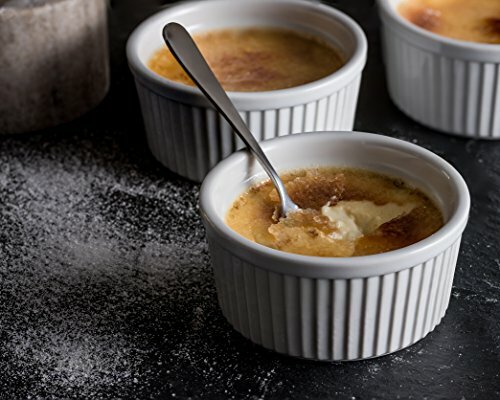 THICK, GLAZED PORCELAIN CAN HANDLE IT ALL: These ramekins move easily from the oven, to the microwave, and then to the freezer without breaking a sweat. When youre finished eating that delicious lava cake or creme brulee, send it through the dishwasher for easy cleanup. WONT ABSORB ODORS, FLAVORS OR COLORS: Glazed porcelain is elegant, eco-friendly and versatile, unlike plastic. Never worry about harmful toxins leaching into your food. Safe to use around your family. LOOKS GREAT ON ANY TABLE: These classic white porcelain ramekins go anywhere and look fantastic in any setting. You can serve food in them, eat out of them, and never worry about chips, nicks, cracks, and scratches. 100% FULL ONE-YEAR WARRANTY: Bellemain Porcelain Ramekins will resist scratches, chips and cracks, but if they don't perform up to expectations, let us know. You are covered by a full one-year replacement guarantee.